Selling a pair of Dynaudio D-21 MSP tweeters. The tweeters are the same as the D-21, but having a wave guide/horn. As you can see in the photos they have dimples on the diaphragm. I personally did not hear an effect to the sound. Free shipping to the lower 48 states. Extra shipping fees may apply for PO Boxes and APOs, etc. You don’t need a Xeo Hub or Dynaudio Connect to enjoy the Xeo 2. However the Xeo 2 can also be used together with the Xeo Hub or Dynaudio Connect for example in a multiroom setup or in situations where the source is not close to one of the speakers. LESS THAN 2 MONTHS OLD!! 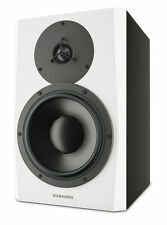 Dynaudio Excite X18 in White Satin. Grills have never been installed. Includes 5-Year Factory Warranty. We will make sure you are happy in the end. Warranty is as is unless otherwise stated. The new Xeo 20 takes all the things we loved about the older Xeo 4 updates them to things we love even more and adds a few new surprises. Don’t want to use wires?. Dynaudio has added built-in aptX Bluetooth so you can stream wirelessly from any compatible device. Dynaudio S4-W65. frequency response: 55-20,000 Hz (±3dB). designed, engineered, and assembled in Denmark. impedance: 8 ohms. sensitivity: 87.5 dB. The system uses cutting-edge digital processing to sense where it's been placed. Set it up from the free Dynaudio app and then just… listen. TV and Video. No more wondering what to listen to next from your online services: the Music Now feature knows what you love and plays it at the touch of a button. The Hub connects to your music sources and sends a lossless wireless digital signal to the Xeo 4 or Xeo 6 loudspeakers, or to the Link. The Hub features three digital inputs It also features two analogue inputs. (2)Xeo 6 Wireless Floorstanding Speakers. Xeo 6 Wireless Floorstanding Speaker. The Xeo 6 minimizes your system to the essentials: the audio source connected to a Hub or Connect and two floorstanding loudspeakers. "With the all-new Contour, we applied all our experience, all our expertise – and all our passion – to looking at what made the original so good… and then gave our engineers free rein to make it even better.". This is the original "Audience Center". There is no further model designation. Sorry,NO E-CHECKS. NO EXCEPTIONS . Pair of Dynaudio Audience 42 Bookshelf Speakers. These speakers are in good used condition. There is typical wear and tear apparent on this item. Scuffing and scratches are generally present throughout. Don’t go assuming that a compact speaker has small-scale sound. The tuned bass-reflex port and long-throw driver are optimised for smaller and mid-size rooms and Dynaudio's designers have made sure they’ll still work shoved up against a wall or on a shelf – because they know not everyone has (or wants) a dedicated listening room. Pair of rare Dynaudio D28 AF SQ tweeterswith blown voice coils. Otherwise in good condition. You fix, you save. The woofer and mid/range diaphragms are comprised of the MSP material developed by Dynaudio, and achieve a perfect sonic integration via the finely-tuned and phase-consistent high-grade crossover. Serial Number: Pair No. 8259 SN: 03667555; 03667556. 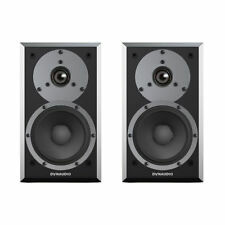 If you listen to a well broken in pair of Dynaudio Audience 42 speakers you wont stop listening. No everything the Dynaudio like the Vandersteen reproduces is as accurate as your going to get at their respective prices. Full factory warranty applies. "The Contour 60 is a big speaker that sounds like a big speaker that costs a lot more. It can reproduce deep, powerful bass; it has a clear, essentially neutral midrange; and it has a revealing tweeter that never sounds harsh. Featuring low distortion, deep bass, and clean sound, these Dynaudio speakers have it all. These main stereo speakers have an impressive frequency response allowing you to distinguish crystal clear highs and powerful bass tones. I've priced these very low. These are better. The bass is impressive for such a small speaker. Mids are rich and detailed. Linear, non-fatiguing highs; not bright. High end sound. Stereophile Class B listed. Dynaudio Excite X18. Condition is New. Shipped with USPS Parcel Select Ground. Up for sale brand new, sealed Dynaudio X18 speakers in rosewood. Both complex sound effects and fine details are easily reproduced yet fit the overall sound character perfectly.". This item does show a few blemishes but is attractive overall and has been well cared for. The Extender is designed to extend the transmission distance between the Hub and the Xeo loudspeakers. Xeo Extender. In-ear headphones. World Wide Stereo:Awe Inspired. Since 1979. Micro USB: 5V/min 500mA. Standing 68" tall, 16.5" wide and 18.7" deep, the C4 Platinum is a tall, fairly narrow speaker that projects out a musical landscape that is wide, deep and tall (relevant room size needed). Frequency response is 27 Hz to 25 KHz via its twin 8" woofers, twin 6" midrange and twin 1" ESOTAR tweeter. You are looking at a pair of Dynaudio Focus 380 floor standing speakers in the Rosenut finish. The pictures do not do the cabinet finish any justice, they are beautiful, This is a great sounding full range speaker great for music and movies, They are approx. Powerful bass, natural mid range, and. High glossy piano finish, and transducers perfect condition. Power Handling 150 W. Crossover 1800 Hz. Dynaudio Excite X14 owner's manual. 2 Bookshelf loudspeakers. bass-reflex (ported) cabinet with rear-firing port. includes a foam port plug for adjusting the speaker's low-frequency performance. 2 Foam port plugs. 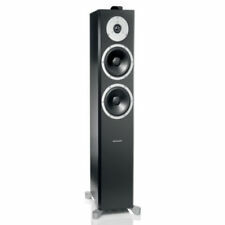 Dynaudio Emit 30 Floor Standing Black/ pair *MUST SEE* L@@K!